Mark Kurlansky has a talent for writing bestselling books about unlikely subjects. His books, Cod: A Biography of the Fish That Changed the World (1997) and Salt: A World History (2002), have appeared on bestseller lists on both sides of the Atlantic. Kurlansky’s latest book departs from his well-known interest in food. 1968: The Year That Rocked the World (2003), is a monumental, vivid, and engagingly written history of a unique period of upheaval that forever altered the course of history. The book’s lively, wide-ranging narrative presents a startling number of earth-shaking events all over the globe, including the assassination of Martin Luther King Jr., the Democratic National Convention in Chicago, the Prague Spring, the Biafran War, the Tet Offensive, the rise of Black Power, and the birth of the Women’s Movement, as well as spontaneous uprisings in Mexico City, Rome, Berlin, Warsaw, Berkeley, Miami, Tokyo and elsewhere. Kurlansky first achieved national and international recognition with the publication of Cod: A Biography of the Fish That Changed the World (1997). The book shows how the cod fish, as a commodity, was central to the development of modern European civilization, and was even responsible for the European discovery of the New World. Kurlansky also features cod recipes, lessons about marine ecology, histories of fishing communities, and many other surprising facts. The book received the James Beard Award for Excellence in Food Writing. Kurlansky followed the success of Cod with Salt: A World History (2002). The book is a portrait of one of the premodern world’s most precious commodities. Salt, Kurlansky shows, gave rise to many of the world’s major trade routes, provoked many wars, and helped finance some of the most remarkable achievements of human culture. 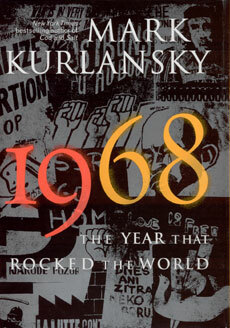 Kurlansky’s other books include The Basque History of the World (1999), A Chosen Few: The Resurrection of European Jewry (1994), and A Continent of Islands: Searching for the Caribbean Destiny (1992). He recently published his first fiction collection, The White Man in the Tree and Other Stories (2000), a novella and eight stories set in the Caribbean. Kurlansky also edited Choice Cuts (2002), an international anthology of great food writing, from ancient to modern times. 1968 was a unique year in history when explosive social movements shook almost every country in the world. It was the bloodiest year of the Vietnam War, the year of the Tet Offensive, the year of the Biafran civil war in which a million children starved to death, a critical year in the Middle East, the year of uprisings in the Communist bloc, Prague Spring, and the Soviet invasion. It was the year of student riots in Rome, Madrid, Berlin, Paris, London, Mexico City , Berkeley, New York. The year of Martin Luther King and Robert Kennedy's assassinations, and of Nixon's election. A year of Yippies and the violent Chicago convention and the emergence of the feminist movement. The central question is, why did all of these events happen in diverse countries over diverse issues but often in very similar ways at the exact same moment? What caused this worldwide event? The various movements had very little contact with each other. It was an age of less communication than today. But they did all have the same influences. Four things stand out. The Civil Rights movement that was viewed on television and covered in the press around the world had made the rebel protestor a hero to be emulated. The Vietnam War, in which the U.S. killed more Vietnamese people every week than died in the September 11 World Trade Center attack, was despised and deplored by people all over the world and became a rallying point. The so-called generation gap made for a sense of alienation among young people. All of this occurred at a critical moment in the development of television so that it had an impact never before felt. What was the importance of the Civil Rights movement? The Civil Rights movement was one of the first to become skilled at playing to modern television. Martin Luther King, himself a master of television, had complained to CBS's Daniel Schorr that television was promoting the wrong type of Black leader. But the The Vietnam War erupted at the height of the age of decolonization when French, British, Dutch, Belgian, and other colonies around the world were demanding and getting their independence. Their cause was embraced by many of the young generation. Vietnam was a former French colony struggling for independence, and the United States was this new entity called a superpower dropping more bombs on this little impoverished land than had been dropped on all of Europe in World War II. The Vietnam War was the one point of agreement among members of very disparate movements. In 1968 in the U.S. the Civil Rights movement was divided between the advocates of non-violence and those of Black Power. But they could agree on their opposition to the war .Movements united in most of the world over Vietnam. In Britain, France, Germany, and Mexico protest started against the American war in Vietnam and later moved on to more local issues. Were the generations that different? Probably more different than at any other time in history. The people raised in the 1930s saw everything in a very different way than those raised in the 1950s. World War II completely changed the world. To the World War II generation, the great failure was not declaring war against the Germans sooner. That was one of the reasons that generation went into Vietnam. But the post-war generation raised in a nuclear age saw war as an irrational response. To them, the great lesson of World War II was that not enough had been done to protest the Nazis and speak out against them. The older generation viewed the cold war as a way of holding the line against Communism much in the same way they thought their fathers should have held the line against fascism. To the generation of the 1950s and 1960s, the cold war was absolute idiocy. They were more interested in the emergence and empowerment of small, poor nations than in the struggle of two bullying superpowers. What was different about the media in 1968? The 1960s saw the dawning of the media age. Marshall McLuhan , who invented such phrases as " global village" and " the medium is the message," was the great prophet of the day. Television's capacity was greatly expanding because satellites made it possible to transmit live television anywhere in the world. Video tape, which was cheap, reusable, and required no processing, was replacing film. Lyndon Johnson in 1967 and '68 was the first president to make the State of the Union address a television event. The coverage included commentaries by notables who were the beginning of television news pundits, so-called talking heads. Four extraordinary television events in 1969 changed the role of media in society: The coverage of the Tet offensive brought war into living rooms in a way that had never before happened. Seventeen minutes of a police rampage against demonstrators during the Chicago convention was almost instantly transmitted around the world. The Soviet version of their invasion of Czechoslovakia was exposed by television footage smuggled out of the country .The Apollo missions to the moon broadcasted live back to Earth. What was happening in the Soviet bloc? It was remarkably similar to the Western bloc. While Western youth were questioning and starting to reject capitalism, youth in the Soviet bloc, especially those from good Communist families, were beginning to question and criticize their system. There were student uprisings in the streets of every city in Poland. The Romanians and Yugoslavians were demanding more independence. Czechoslovakia under Alexander Dubcek was redefining Communism, going back to the Marxist idea of a state with free press and individual liberty .The Soviets, fearing the Czech model would spread, crushed it. The irony is that the Czechs were extremely loyal to the Soviets and their model, had it spread, might have saved the Soviets. Instead, we now know, the Soviet invasion of Czechoslovakia was the beginning of the end. What was happening in the Middle East? The Middle East in 1968 was in the aftermath of the Six Day War. The Six Day War was one of history's most dramatic examples of Ghandi's teaching that peace could not be achieved if an enemy was humiliated in defeat. Israel had taken a great deal of valuable land and now wanted to give it back in exchange for peace. But the Arabs were not accepting peace, or even talking about it. The Palestinians and the leading Arab states made it clear in their statements that they were committed to an armed struggle to destroy Israel. In 1968, Yasir Arafat, a young guerrilla fighter who had gotten his start only a few years earlier with a failed attempt to blow up a water pump, took control of the PLO. Increasingly, the strategy was shifting from conventional warfare to such guerilla raids. 1968 was the year the word "Palestinian" became widely used. Palestinians are ethnically the same as Jordanians and before had been widely referred to as " Arabs in Israel." The newspaper dateline for stories from the West Bank was " occupied Jordan." Palestinian was a word used for terrorist commandos. But in this year, in which the struggle of emerging nations was fashionable, the Arabs in Israel were increasingly thought of as a struggling nation. What was the Biafran War? Biafra was where the West learned of the tragedy European colonialism had inflicted on Africa. As Europeans left, they divided their former colonies into countries with no regard for their ethnic composition. Nigeria was considered the most promising of the new African countries because it was rich in oil. But the oil region was dominated by the Ibos, whereas the rest of the country was dominated by Hausas and Yorobas. In 1967 the Ibos broke away from Nigeria and named their new country Biafra. In 1968 the Nigerian army was able to control air, land, and sea access to Biafra but was not able to defeat them. And so they began to starve them, preventing any relief food from getting in. One million children starved to death in Biafra. How did 1968 change the world? It was the beginning of the end for the Soviet Bloc. The student movement in Mexico laid the groundwork for enormous changes there. In the U.S. it did the opposite of what it was supposed to do. Instead of starting a revolution it entrenched the right and changed the entire configuration of American politics. How did it change American politics? Up until 1968 there were not huge differences between the Republican and Democratic parties. There were pro- and anti-war leaders on both sides. The Republican party had considerable black support. The disastrous 1968 campaign of Nelson Rockefeller, according to polls the most favored politician, destroyed the liberal wing of the Republican party .The NeuJ Yark Times predicted accurately that it was the end of Republican liberalism. Nixon adopted a strategy followed by every national Republican since, of appealing to white Southern racism with an anti-civil rights rhetoric. No Democrat has since secured a majority of white Southern voters. Nixon targeted the Supreme Court, destroying Abe Fortas and attempting to undo Douglas with his dirty tricks team. The legal adviser behind these moves, William Rehnquist, was appointed to one of the four seats that opened during Nixon's term. 1968 seems like a tragic year, and yet there is a nostalgia for it. It was a tragic year. Two of the most inspiring leaders this country has ever produced were murdered. One million children starved to death in Biafra. Fifteen thousand American servicemen died for no reason in Vietnam that year and killed a few hundred thousand Vietnamese. And yet there was this one lesson that has inspired people ever since. People felt empowered that they did not have to sit at home, infuriated, watching events unfolding. They could get out on the street and march or even scream and they would be heard. What are the relevant lessons of 1968? There are many. We learned that if you try to change the world the people who presently control it will stop at nothing to prevent you. The military learned a lot. They learned that if you do not have a draft, college students will not feel a personal involvement and war will be quietly left to the poor. They learned not to give body counts and in fact to give almost no information about enemy casualties so that the impression is given that war is bloodless. The public, on the other hand, should have learned. When we hear the government talk about "staying the course" in Iraq to build democracy by helping our friends the Iraqis, we should remember that we have heard all these lies before. Most importantly, we learned that people banded together do have a voice even when there is not democracy. Probably the most popular writer of 1968, even though he was already dead, was Albert Camus, who once wrote, "The longing for rest and peace must itself be thrust aside; it coincides with the acceptance of iniquity .Those who weep for the happy periods they encountered in history acknowledge what they want: not the alleviation but the silencing of misery."